Much as we love walking, occasionally it's nice to look forward to something different. When Linda and Mick invited us on a day out, we jumped at the chance to tag along to the Devon Miniature Railway Centre. If you like rollercoasters, all the bells and whistles and a slick, sometimes soulless theme park experience, you might want to turn around in the car park and go home. But if, like me, you prefer a smaller-scale, family-run business you might find much of interest. Once inside, Mick, a self-confessed model railway enthusiast, was in his element. While I don't entirely share Mick's passion for double-O gauge paraphernalia, I do consider myself a connoisseur of English eccentricity. And the Railway Centre has more than enough of the latter to keep me wryly smiling. And trust me - it's not wind. The model railways are appropriately housed within old train carriages. Everything is encased behind glass; immaculately landscaped, everything to scale. Many of the exhibits have been donated by Model Railway clubs from around the country. Inside the carriage, you push a button and a train comes out and chuffs past you to disappear into the tunnel at the other end. Though the novelty soon wore off, I did find plenty of eccentricity in here, mostly of the 'Can you spot the man sat on the toilet reading a newspaper?' variety. A bit like those 'Where's Wally?' posters, I suppose. Outside, they have a thing about gnomes. The owners have collected them and all the gnomes have names. One is called Rusty and if he behaves himself, Rusty is allowed to drive the train. Alright - I made that last bit up but I can imagine something similar happening in the dead of night when all the gates have been locked and the grown-ups have gone to bed. Then the gnomes will come out to play. 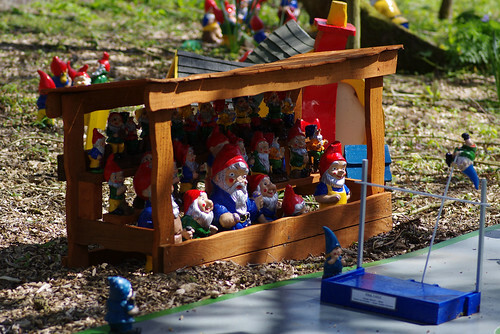 Gnomes are cute and kitsch and possibly a wee bit naff but there is also (very deep down, I'll admit) a touch of menace. Or, perhaps it's just me. One of the quirks of the Pentax's auto-focus system is that while the majority of subjects can be in focus, some on the margins appear blurred. Here, Sherry has managed to capture a sense of movement. Unless, of course, we blinked and the gnome was actually polevaulting. We all went together on the model train (including the Lady) although the rattling and creaking was a bit much for the Collie's ears. We pulled to a halt at the halfway point, where the driver explained that the site used to be derelict before the current owners brought everything in. As well as the machinery, lots of trees and flowers have been planted in the intervening years. Two weeks before, the river had burst its banks and flooded the picnic area. After our tour on the train, I cajoled the others into a game of crazy golf. 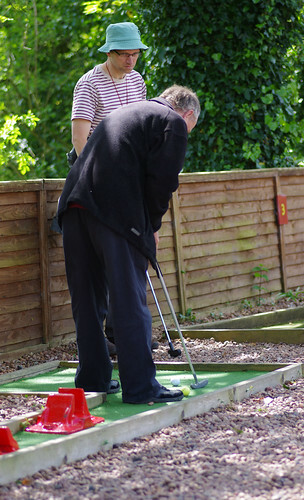 I was aware I took my crazy golf seriously but I didn't realise I took it that seriously! The course looked deceptively simple and soon put me down a peg or two. Thankfully, that look got its just desserts. Mick 'the Stick' Watson won by a single stroke, thanks to an impressive hole-in-one at the third hole. We bid our fond farewells to the Railway Centre, passed Bickleigh Mill and took the first footpath left towards the River Exe. I looked at the map, wishing the distance between us and Tiverton would evaporate. But I knew that there was not enough time left to go there and back. And I certainly failed to factor in all the wonderful flowers, some of which we had never encountered before. We see Atlantic Ivy often on our travels. 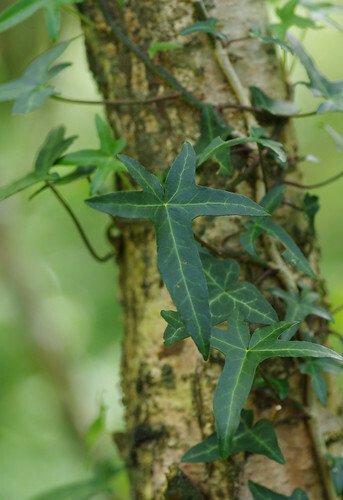 It's common in the region and is different to the main species of Ivy largely due to the pointed nature of the leaves. I think they look a bit like the shape of a bird's foot. Our path led up through a wood and then towards the river, where on a gravelly island, the bloated corpse of a cow had washed up. One can only imagine the sheer force of the water. We walked soberly on, examining the verges for anything of interest. The Lady was tickled pink to be back in her natural environment after her ride on a bumpy, rattling train. We soon followed her cue and stopped for lunch on a sandy riverbank further upstream. It was a gorgeous spring day. 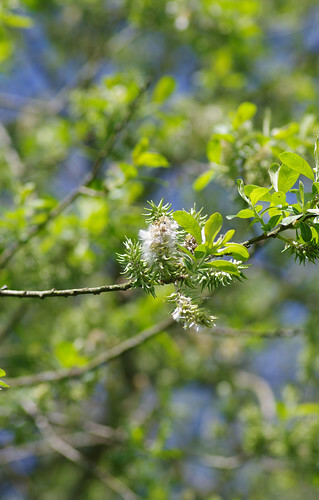 Everything was green and glorious and bursting with colour and life. 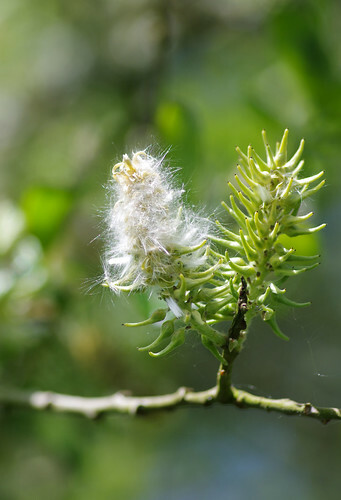 Above: The female catkins are a spiky fruit before they develop a woolly growth. Clearly, we were on a roll; in danger of getting carried away and in need of an additional memory card. The ideal light persisted and the breeze was almost non-existent. If ever there was a time for adding as many species to our photographic database (be they common or not), it was now, and there for the grasping. This orchid had me flummoxed for a while. 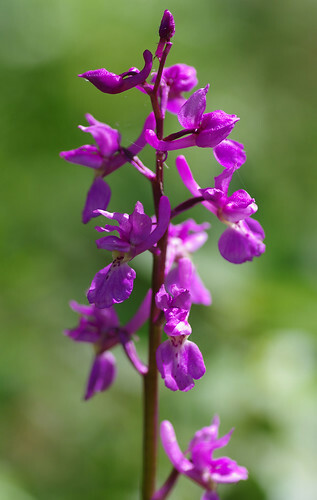 At home, browsing through the field guide I thought I had found a Loose-flowered Orchid (only found in the Channel Islands according to the book.) 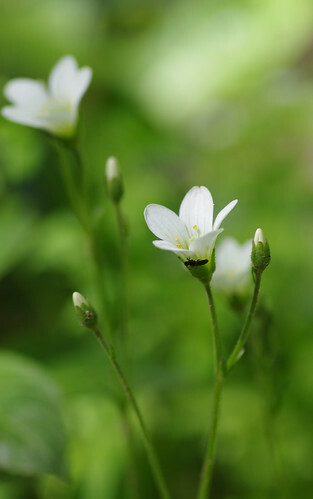 The formation of the flowers looked identical. But then I remembered the spotted leaves. 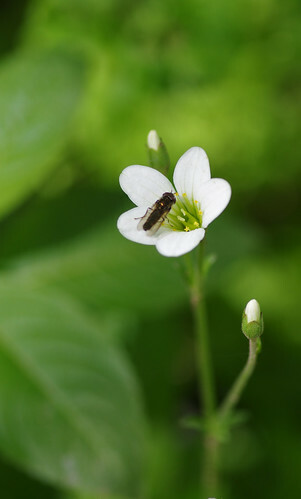 I checked on http://www.flickr.com and found in one of the botanical groups just how much an individual species can vary according to location and a whole host of other factors. At this point we approached a gate, wondering if the group of cows staring intently at us from the other side were going to back off and kindly let us through. 'Heads down,' I said. 'Avoid eye contact and don't raise your voice.' 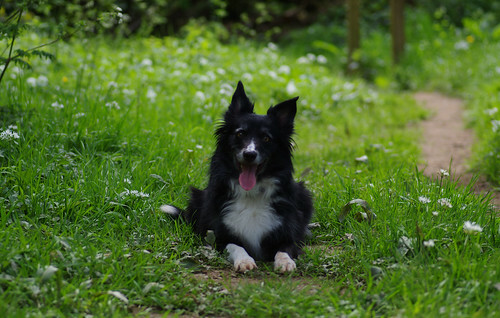 Sure enough, my cautious approach worked a treat, and the curious cows back-hoofed, still looking at four humans and a canine trying not to leave footprints across the field. 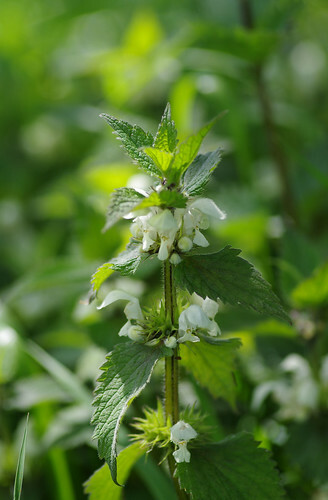 And then we saw it: a flower we had certainly never encountered before. At home, matching the photos to something in the book proved such a headache I thought I might need to go far away somewhere for a few days and have a good lie down. And then when an expert kindly volunteered I couldn't believe my luck. 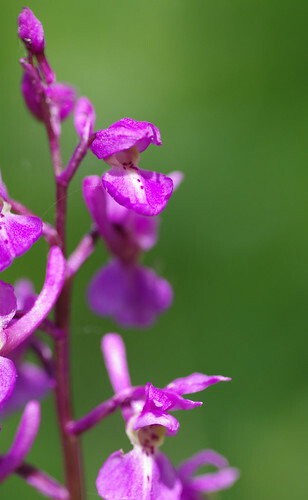 With many thanks to Anna at the Sharpham Trust for the identification. Sadly, even though we were wondering what delights awaited around the next corner, we were approaching the point when we had to double back. 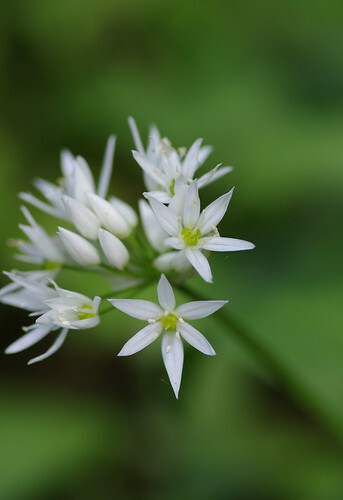 Sherry has captured these Wild Garlic flowers literally hundreds of times before but never quite like this. To my eyes these pictures are just the right blend of soft and sharp. I can imagine them both as covers for greetings cards. Similarly, if I had a pound for every time we've seen bracken, I could quite easily retire and live like a king. 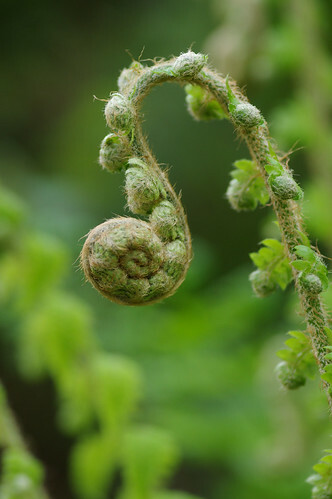 On every occasion I've seen bracken in its embryonic state, I don't think I've ever thought of an elephant's trunk. And yet it seems so obvious now, it must have been in front of my eyes and I just couldn't make the connection. On the way back, we encountered a variety of micro-moths and a strange, gold and blue shiny bug that was nonetheless perfectly camouflaged against the fading petals of a bluebell. We also passed Woodruff flowers, having incomprehensibly passed them on the outward journey and not batted an eyelid. I've never seen woodruff flowers in our native South Devon before. But here, towards Mid Devon, the underlying soil must be different and there were quite a group of them. Unfortunately, they weren't being too accommodating when it came to having their picture taken. 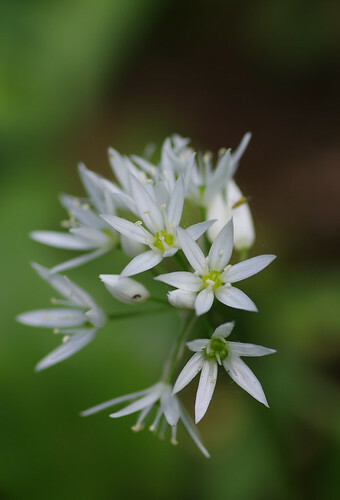 Just as Sherry made the wild garlic come to life, so the white woodruff flowers were mushy and lacked definition. And the arrangement of leaves below was all grainy. It was a shame but I'm sure we will one day see their like again. They are an AWI or Ancient Wood Indicator, which means we are bound to come across them some time in the future. As a consolation prize, though this dandelion came out perfectly. This overhead view illustrates how composite and complex a dandelion flower actually is. 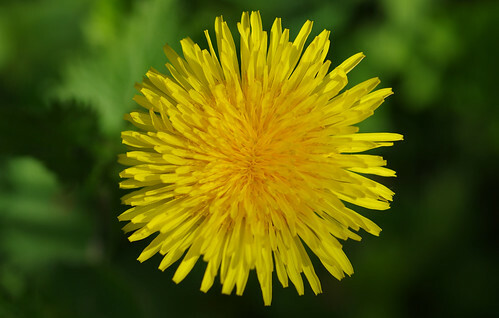 I did not realise until recently that dandelions are comprised of literally hundreds of similar microspecies, which can prove very difficult for even the professional botanist to distinguish. Aspiring amateurs like myself have no hope so I'll sign off for now before I give myself another headache. NOTE - Should you wish to explore this delightful stretch of the Exe and the wider area, you will need OS Map Explorer 114. It's double-sided, incorporating the Exeter area and then extending to the Southern fringes of Exmoor. I can't wait to return here soon and pick up where we left off.